(a) Calculate the work done on a 1500-kg elevator car by its cable to lift it 40.0 m at constant speed, assuming friction averages 100 N. (b) What is the work done on the lift by the gravitational force in this process? (c) What is the total work done on the lift? This is College Physics Answers with Shaun Dychko. The work done by the cable pulling the elevator upwards equals the force exerted by the cable, multiplied by the displacement of the elevator. We're going to take upwards to be the positive direction which means the force exerted by the cable is positive and the elevator's displacement is also positive because we're told its going upwards. So the force exerted by the cable has to balance the force downwards due to friction and due to gravity because we're told the elevator is moving with constant speed which means the up forces are equal to the total down forces. there is no net force vertically in other words. So cable force equals friction plus gravity, and gravity is the mass of the elevator multiplied by gravitational field strength, g. So we substitute this in place of F c in our W c formula. 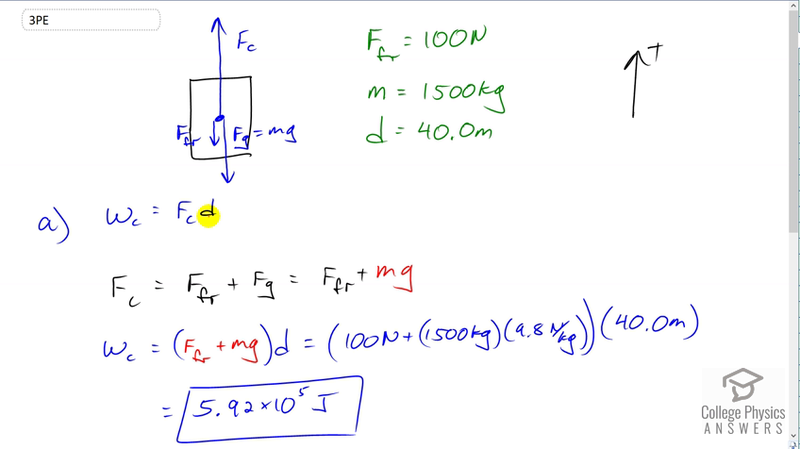 So the work by the cable is force of friction plus m g multiplied by the displacement. So that's 100 Newtons of friction plus 1500 kilograms, mass of the elevator, times 9.8 Newtons per kilogram and then all of that is multiplied by four g meters giving us 5.92 times ten to the five joules of work done by the cable. The work done by gravity is the force due to gravity multiplied by the displacement. Now, gravity is directed downwards and that's the negative direction. So we write negative m g in place of gravity and multiply it by the displacement which is positive and upwards. So we have negative 1500 kilograms times 9.8 times 40 meters giving us negative 5.88 times ten to five joules of work done by gravity. Now, the net work done is the net force multiplied by displacement but since the elevator is moving at constant speed, the net force is zero. So there is no net work done. i used these exact methods to solve my problems and they came out wrong every time. Help please. Hi brussell, I know physics can take a lot of effort to master. If you have more specific questions, please post them below the solutions, and we'll see what we can do.